If you find yourself shooting in portrait (vertical) orientation a lot, you probably get tired of the awkward pose required to hold the camera: your right arm and elbow are high in the air and bent over to your forehead. Beyond a lack of comfort, this isn’t necessarily the best posture for sharp shots, either. 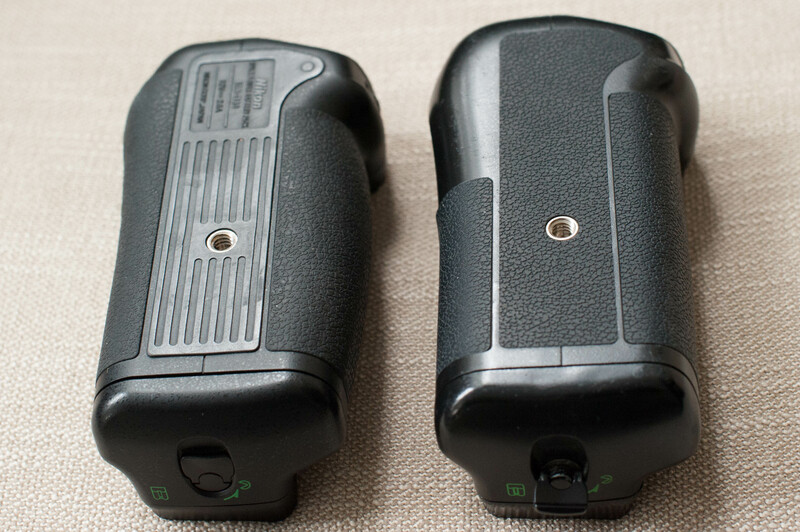 Other than moving to a tripod (which doesn’t work if you’re highly mobile), one solution is getting a battery grip. There are two big benefits. First, you can now hold your camera in the standard way in portrait (tall) or landscape (wide) orientation. 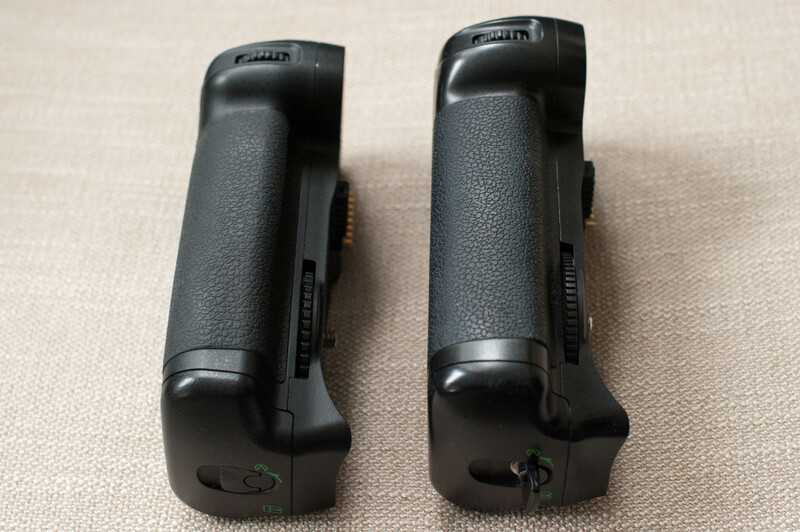 Second, the grip contains a second battery that gives you serious battery life – especially useful if you’re shooting a lot of flash. I’ll start by saying the grip I’m “reviewing” here is an old one, so it is completely possible that improvements have been made for the newer cameras. However, I doubt the conclusion is any different at all (provided here for those of you already chafing to click close and hit Reddit): For the money, they are a very good deal and work well enough. If you use one a lot, you may want to spend the extra bucks on one from the manufacturer. Read on for details. The plastic on the Zeikos is smoother and shinier. 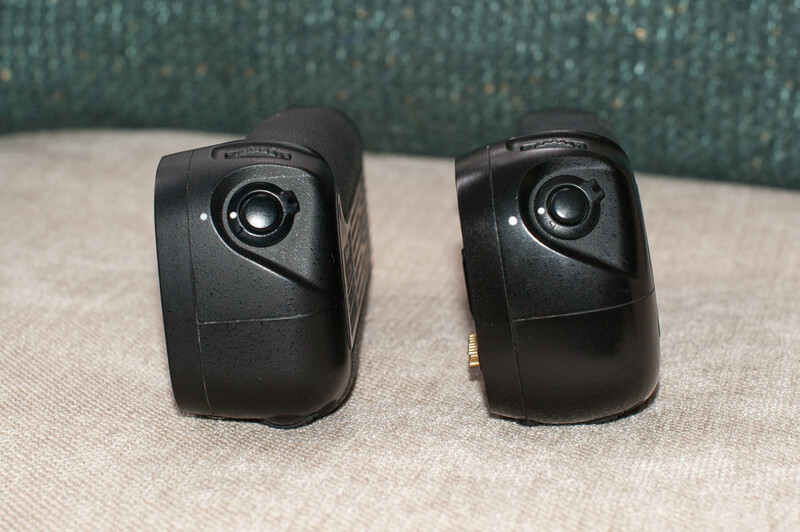 The feel of the power button is similar, but the shutter button is smoother/more progressive than the Zeikos, which has a slight but definite “break” for the shutter release. I don’t classify that as a negative outside of the fact that it isn’t consistent with the body – It felt fine when shooting. The Zeikos feels a little less “full” in my hand. The Nikon grip is rounded out toward the front, and has a cavity for your fingertips (you can see that well in the first shot). This is definitely preferred. The Nikon rubber is slightly grippier as well. 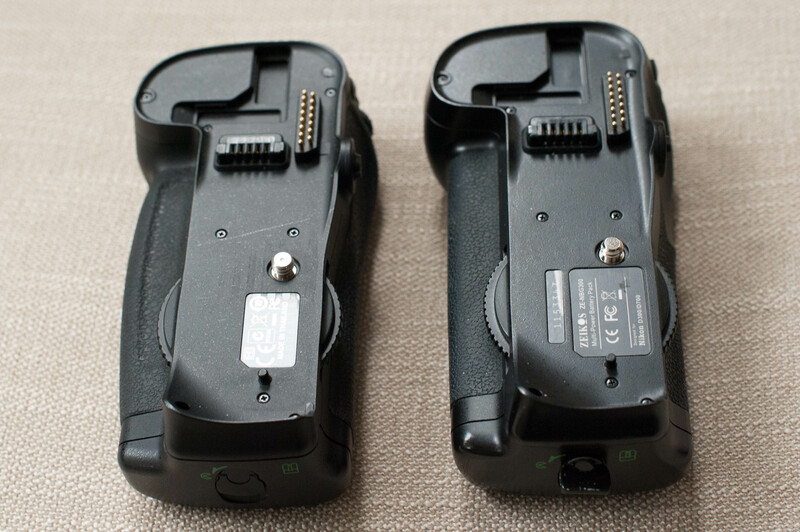 The Nikon wheels are slightly rubberized vs. hard plastic for the Zeikos. 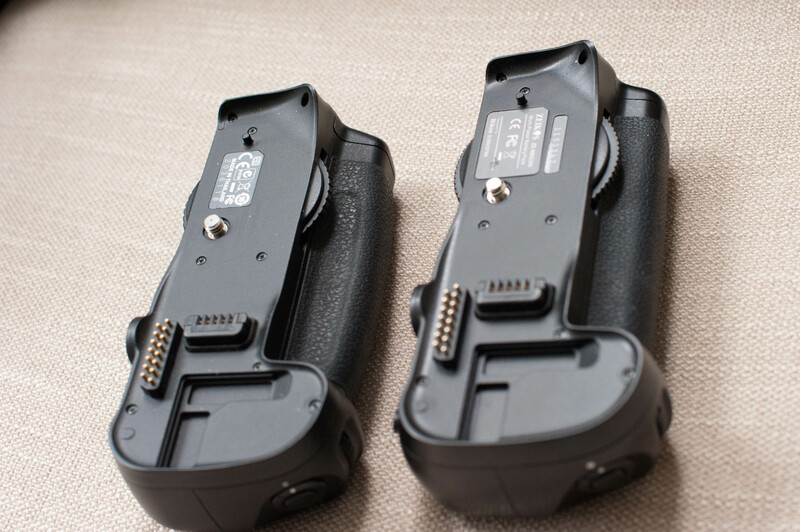 Nikon obviously has a rubber bottom area where Zeikos continues with the grip rubber. Probably a wash unless you put your camera down on the bottom routinely. I’m not sure how well the Zeikos grip would hold up if you’re using an L-bracket (probably fine). The tripod mount seems beefier on the Nikon. More rubber on the Nikon grip on the back, along with the rubberized wheel. I think if you’re using the grip sparingly this isn’t an issue. If you use it a lot in portrait mode, I’m guessing the hard plastic at the thumb might get tiring. The AF-ON button is labeled on the Nikon. The button feel is pretty similar here, though the edges of the Nikon button are smoother and more integrated into the body of the grip. Joystick feel is similar, with the Nikon feeling a little tighter/more refined. 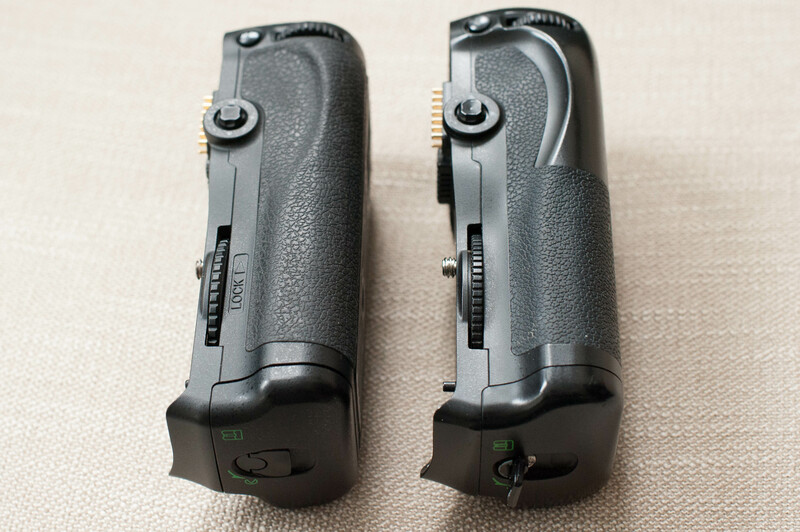 The click action for the Zeikos isn’t as defined as the Nikon, which made 1-click zoom less certain. This is the biggest single issue I have with it. Not a killer if you don’t use that a lot (I do). 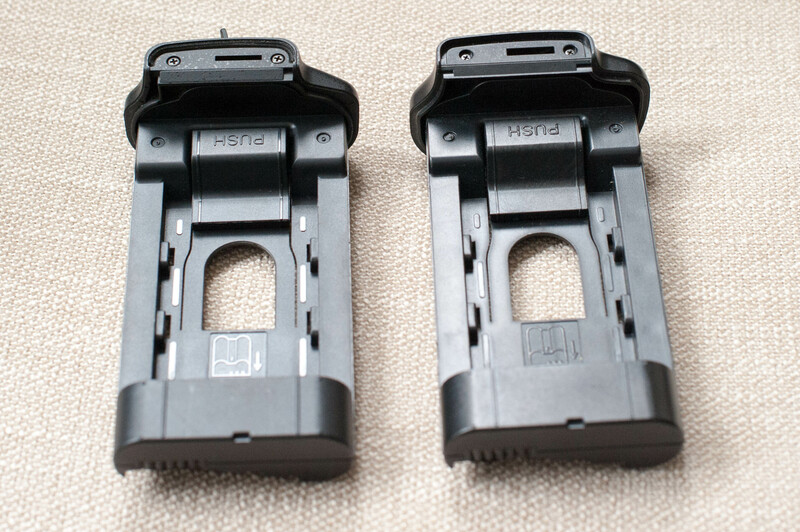 Battery trays are nearly identical. Again the Nikon tray seems…beefier…and a little smoother when installing and removing from the body. The shape of the tray handle is a little more elegantly molded for the Nikon, though that is just aesthetic. Conclusion: Overall I think the Zeikos grip is fine. If you aren’t using a grip a lot, I think the function-for-value equation is really good. There are a few things that clearly aren’t up to Nikon’s standards, but you’re not paying Nikon prices. I haven’t seen the Canon equivalents, but I’d guess the conclusion is the same. If little things bother you, grab one from the manufacturer. Buying used is often a way to save some money, too.